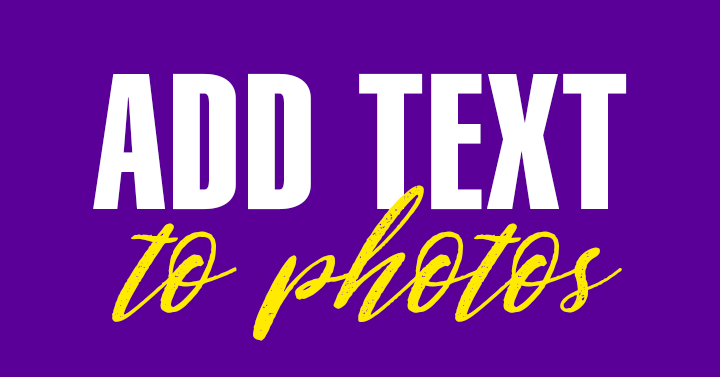 Looking for iPhone apps to add text to photos? Photos with text are the hottest thing in visual content! Images are 93% more likely to be shared on social media than any other type of content. If you can’t take a good photo to save your life, images with text are your answer! Added text not only improves and explains your own photos, but many of these apps provide backgrounds, so you don’t even need to supply a photo. Of course, there are many ways to add text to photos! Prefer a desktop tool? PLUS, we have NINE design apps for Android in the article below. Not just for iPhone! This post was originally published in July 2015, and updated August 2017 and April 2019. I’ve searched out the top typography apps for iPhone. The yellow button links will take you to the Apple App Store. Below the button, look for a text link to the app for Android on Google Play. There’s been a shakeup in the apps world! In the early 2010’s, graphic design apps popped out like cherry blossoms in Spring. But many have withered – they’ve been removed from the App Store, or haven’t been updated in years. Here are details on the top ten iPhone apps to add text to photos, with more in the list at the end! These 10 have thousands of positive reviews and 2019 updates. Older apps have been deleted from this post. Most of the apps are free to download, but to get all features, they’ll run you from 5–15 bucks a month. Try a few before committing to a subscription – none can do everything. See which one(s) suit your style and give ’em a whirl. Most have a free version, and/or a 7-day free trial of the premium version. Sometimes, simple is good. WordSwag is one of the simplest, yet coolest, text on photo apps. WordSwag and Typorama (below) are similar in that they’re built on a type engine that generates a complete typography design for you at a tap. Tap again and again until you find a design you like. Save it if you like it, as that design may not come around again! They also offer image search right in the app – free, public domain photos from Pixabay. 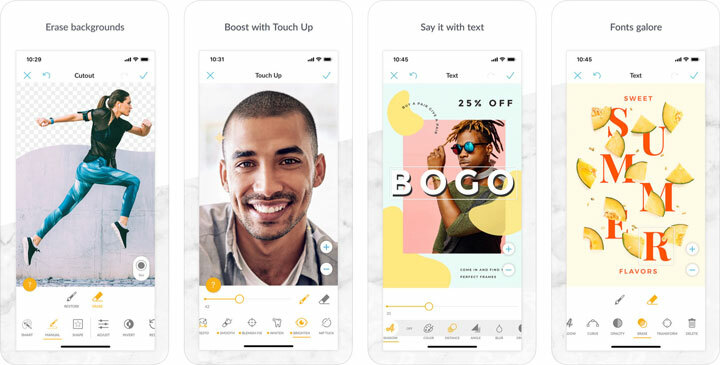 Plus, both apps provide unique backgrounds of their own, the ability to choose an image from your camera roll, and quotes to use right in the app. Word Swag is the original, and it’s great, but really hasn’t changed a lot over the years. That also makes it streamlined and simple, though. It includes 16 different social media sizes, including Pinterest pin size and Instagram Stories. WordSwag is currently free to download and $4.99 per month for the Pro option that allows high resolution downloads and logo branding. Check out Word Swag: Easy Text on Pictures here. Word Swag for Android users is available here. I’ve used Typorama and found it to be fun and simple. Many others have too, as evidenced by their 75,000 reviews with a 4.8 star average. Typorama lets you create amazing visuals by “automagically” transforming your text and photos into beautiful typographic designs. No design skills needed! Just choose a background, type in your words, and your creative typography is ready! Typorama saves you tons of work by automatically creating complex text layouts with different fonts and typefaces. In just a few taps, you get your text beautifully laid out on a background of your choice. This could take hours using Photoshop. Note: The text designs are not templates. They are generated randomly as you choose different styles. If you see something you like, grab it, as you may never see that same type design again! Create Instagram, Facebook, Twitter posts with eyecatching text designs. Create flyers and posters for your events or organization. Make headers for your blog or wallpapers for your iPhone. Turn your designs into physical goods and sell for profits, full commercial use with all included images and fonts allowed! You can export your creations at up to 2048 x 2048 pixels. Preset sizes are included – even a 2 x 3 size that’s perfect for Pinterest. Check out Typorama: Text on Photo Editor here. If you like the free download, I think you’ll be pleasantly surprised at the reasonable upgrade fee. This one’s not available for Android. When I was creating a lot of Instagram graphics, Over was my preferred iOS design tool. Over app comes with designed templates and text overlays. A few are included in the free version, but you’ll get the best choices if you upgrade to Pro. This is as easy as you can get. You don’t even have to think of words! There are also fonts included to use your own text instead of a pre-made greeting. Choose an image to use as a background from your camera roll, or search Unsplash for free CC0 photos right in the app. You can search Google for images right in the app, but beware – anything you find may be subject to copyright (unlike the search functions in the apps above). There are loads of image editing options, text editing options, social media sizes – pretty much everything you need. Create in an instant: Pick a template or start from scratch. Either way, it’s a breeze. Choose templates or fonts for social media posts, posters, ads, flyers, and more. Edit and perfect your photo or video to your heart’s content. Customize it: Add text. Pick photos, videos, colors, fonts and graphics. Share and schedule: Share to Facebook, Instagram, Snapchat and more. Or use post scheduling and take the rest of the day off! It’s fairly pricey at $14.99 on a monthly subscription, or $99.99 per year for the Pro version, but if it replaces Photoshop for you, it could be worth it. Definitely faster and a lot more inspiring than staring at a blank canvas in Photoshop! Check out Over: Edit & Add Text to Photos for iOS here. Over app for Android is available here. I have not used the iPhone app, but I love Adobe Spark Post as well as Spark Video on desktop. Bonus! If you have a paid Adobe Creative Cloud subscription, Adobe Spark Premium for the app is included. That’s a great plus! The Premium version makes it easy to incorporate your branding and templates. Your Posts are synced across your computer and mobile devices so you can create and share wherever inspiration strikes. Adobe Spark Post is the fun, fast and easy way to create stunning graphics for all occasions. Get started in seconds with professionally designed templates you can tweak with just a few taps. Pick your photos, add text and apply Design Filters to instantly create beautiful, eye-catching graphics. Each tap gives you completely new layout, color palette, typography style and filter—no design experience required. The Premium version includes even more beautiful templates, but the free version is no slack either. Animated Video Posts — Tap to create eye-catching animated posts and share them as videos. Design Filters — Transform your text and photos into professional-looking graphics in 1 tap. Auto Resize — Instantly resize your design to perfectly fit each social platform. Auto Recolor — One tap to change the color palette of your design and make it pop. Magic Text — Resize your text and beautiful typography will be applied on-the-fly. Magic Layout — Combine your photos and text into stunning and memorable collages. Text Cutouts — Reveal the background image through your text in a tap. Plus, you can easily share your designs via your favorite social platforms, text or email to wow your audience. 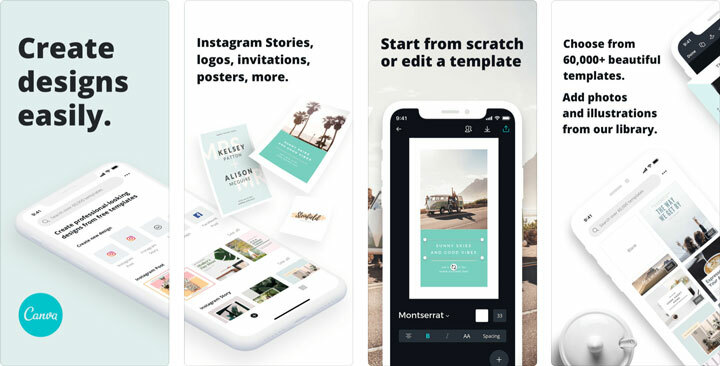 Try Adobe Spark Post Graphic Design Collage Creator here. Download Adobe Spark Post for Android here. PicMonkey is one of my favorite online photo editors and design tools. Read more about PicMonkey desktop here. Their mobile app is just as fun and funky. And versatile! Not only can you add text to photos, you can also perform some editing magic. The portrait touch up tool is particularly powerful. This one will best suit users who take their own photos. Easily boost pics with photo editor effects like Sepia, B&W, and Ombre. Add graphic stickers and your own overlays—like your logo—and keep transparency. Add text to photos, and style it right with customizable drop shadows and spacing. Erase backgrounds automatically (or manually) with Cutout. Draw, erase, and adjust transparency on everything, including graphic stickers. Boost photo design with fresh, unique graphic stickers. Crop and resize images for Facebook, Twitter, Instagram, Etsy, and Pinterest with pre-made sizes. Retouch photos on the quick with “Presto” automatic adjustments. * Some features require in-app purchase. Full use rights are included with your PicMonkey desktop subscription. Not a PicMonkey user online? Read more about PicMonkey here and feel free to purchase via my referral link on that post! Or just check out PicMonkey Photo Editor Design for iOS here. PicMonkey for Android is available here. 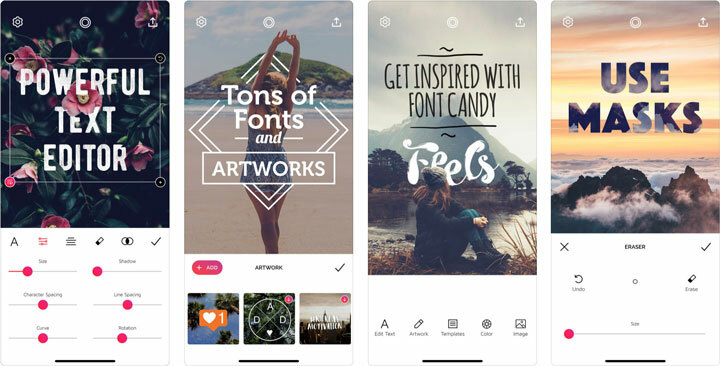 Everyone knows Canva, and now it comes in an iOS app! I personally have not used this app. I do feel the online Canva has quite a learning curve, and their terms and licenses are incredibly complicated. Suffice it to say, do not use any Canva creation for resale unless you’re positive every element you’ve used includes commercial use rights. That seems to preclude social media posts and other business promotion such as flyers, so depending on your needs, you may wish to check it out! Instagram Story Editor, and Story highlights maker. Create Facebook Posts & Facebook Covers. Design Twitter banners & Youtube thumbnails. Make cards, evites, photo collages and even use Canva as a poster creator for any social media use. Create a logo, book cover, blog design for any project. For any event: birthday card maker, wedding invitation maker, evite creator. Simple and free image editing app. Photo collage maker, flyer maker, banner maker for any occasion. Design motivational quotes and humorous memes. Party invitation maker, school poster maker, video banner maker. For business: brochure, resume, presentation, promo poster maker. 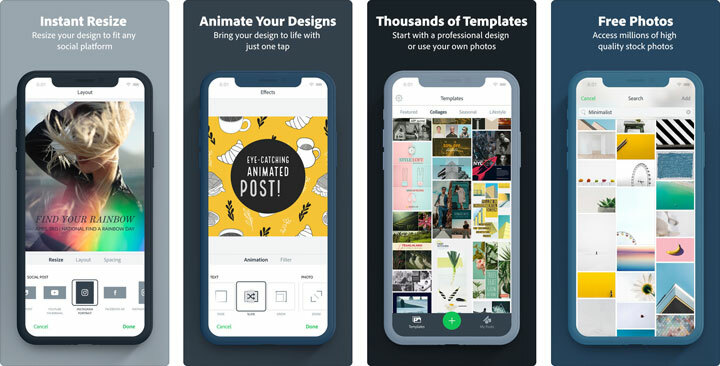 Check out Canva Graphic Design Creator for iOS here. Download Canva app for Android here. Phonto is a simple app that allows you to add text to pictures. It also offers a lot of customization abilities! More than 400 fonts are available, and you can install other fonts. Text size, color, and gradient are changeable. Text’s stroke, shadow, and background color can be changed. Text can be rotated, as well as placed on a curve or perspective. Text kerning and line spacing can be adjusted. Parts of text are erasable. Items (Balloon, Rectangle, Star, Heart) are available. You can use not only pictures, but also plain images to write text. You can share photos on Facebook, Twitter, and Instagram. Phonto has 4.8 of 5 stars in the App Store, with a lot of positive reviews. It’s free to download, with in-app purchases. Check out Phonto – Text on Photos here. Phonto for Android can be downloaded here. Here’s another popular one, though not as well reviewed. You can download it for free, but the Pro subscription price appears to renew weekly, which could get expensive. Choose from a curated collection of fonts or add your own to overlay beautiful text on your photos. Get creative and add intricate designs using shapes, symbols, or emojis. Over 45 artistic, hand-picked fonts. Powerful text editing capabilities including text curving, opacity controls, and shadow. Add multiple captions and manipulate each one separately to make your edits truly unique. Built-in custom Artwork and Quotes we’ve designed for you. Colors and filters you can apply over the background image or the text. The ability to design and order custom iPhone cases, Posters, T-shirts, Magnets and more! Save your designs and watermarks to the app to edit photos in seconds. Fun animations you can add to your text. Scale and Crop options with preloaded sizing for different social media platforms. Share your work with friends on social media. Check out Font Candy Photo & Text Editor here. An alternative named Font Style Candy for Android can be found here. 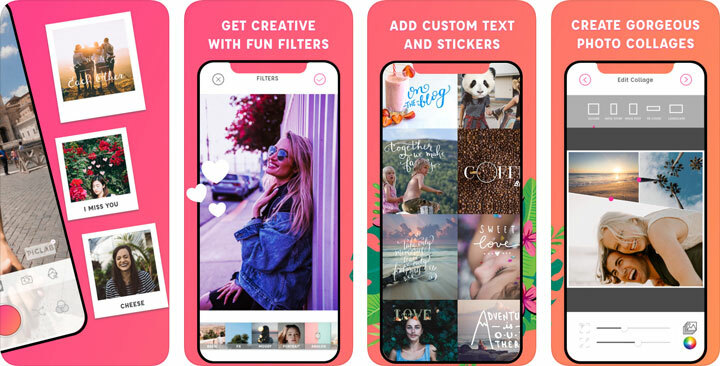 PicSee says they’re the easiest way to add fun text, artworks and stickers to your photos. I haven’t tried this one, but it has 25,000 reviews averaging 4.5 stars. The photo effects and gradients look pretty fun! Fine Adjustments: Advanced options for adjusting the font of your text, including 3D, partial eraser, arc-aligned text, adjust (leading & tracking), shadows (color & size), bold, convert UPPERCASE etc. Fantastic Fonts and Text Arts: Choose from 100 + fonts and pre-designed text art to inspire your creation. Adjust the size, color, pattern, rotation, position, spacing, and alignment to perfect your design. Typography Designs: Plenty of typographic styles make it easy to create beautiful pictures and posters with eye-catching designs. Huge Collection of Stickers: 200+ creative stickers help you make fun pictures with editable colors and textures. Various shapes and ornaments let you explore your unlimited creativity and enrich your personalized design. Popular Filters: Abundance of professional filters including Natural Lights, Textures, Clear, Nostalgic, and more. Make your pictures stunning with one touch, easily turn your photos into a delicate artwork . Gorgeous Colors and Patterns: Choose from the beautiful colors and patterns to use on your Texts and Artworks. Simply swipe the color picker to choose your style and tone. Make your creations unique. Check out PicSee – Add Text Over Picture here. If you like it, It’s $4.99 per month, and there’s a pretty great discount on the yearly subscription. A PicSee alternative for Android, Text on Pictures, is here. Here’s another popular one with thousands of positive reviews. While mainly a photo editor, it also allows you to add custom text and stickers. Choose from a collection of text fonts to add to your photos. Easily resize, rotate, and adjust text opacity. Multiple text layers to create beautiful typography. Add drop-shadows to your text. Choose from a delightful collection of stickers, overlays & artwork to add onto your photos. Drawing Tool to add rough notes, instructions, captions & more. Plus photo filters and effects, image overlays and masks, collage layouts and more. Check out PicLab Photo Editor and Collage Maker here. Download PicLab Photo Editor app for Android here. The apps mentioned above were checked and updated April 4, 2019. There are so many more in the list. Check them out! Ensure that they’re up-to-date before purchasing. I’ve noted that several haven’t been updated for years. I’ve put the ones I’m familiar with at the top of the list – but YOU can vote up your favorites! Also leave comments right in the list on what you like and don’t. And – if you sign up for a free Listly membership, you can embed this list on your own blog. For about the price of a coffee, you can have a fun new app! If you have a favorite Android type app, please let me know in a comment, and I’ll compile a list for Android users too. Pin this post so you can come back when you’re ready to try more iPhone apps to add text to photos. Enjoy! Right, Terry, and so little time to play with them all! Thanks for visiting. Enjoy your apps! Awesome list!! Most of these are available on Android, also. I use a few, but will definitely try some of the others out. Thank you so much for putting this list together! Hi Lisa! I’m glad to hear you’ve found some good apps for Android. I often get asked if something like WordSwag exists for Android and haven’t seen anything like it. 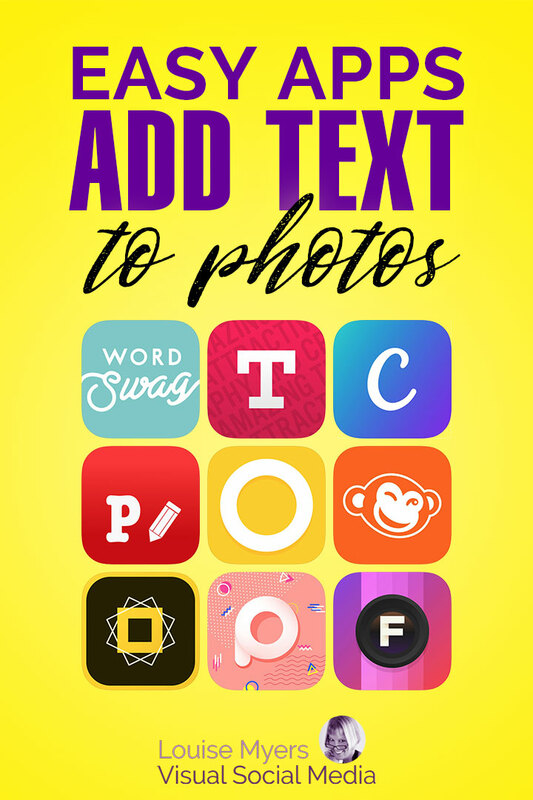 OOh – awesome list of text photo apps Louise! I used to use Wordswag a lot, but now mostly use Canva to create my images on the laptop, but Wordswag is great for more spontaneous graphic quotes. Love your list and will definitely need to check out listly, seems like a handy site for sure! Hey Emily, as the content maven that you are, I think you’ll adore Listly! Listly posts really perform. I’ve wondered what you use for your lovely branded images. So, they save from Canva as PNGs? I was curious about the compression I see on Instagram. I would like to append the free app Bold into this great list. : ) Everybody can create a stunning typographic image in just a few taps. Bold is a free app and has no ads no in-app purchases. Nice app, Yuanhao, I added it. I have a load of fun with these! Hope she does too. I’m planning to start my own blog with picture quotes but I don’t have iPhone, do you know any good apps for android? WordSwag is now available for Android. It’s a good one. Over is also available, but it says non-commercial use only, so it depends how you want to use it. I believe Adobe Spark Post is also on Android. It’s a good one that allows commercial use. Always check the terms if you have something specific in mind, like selling the images. What a great list! Lots of these I’d never heard of before. Thanks Louise. I’m glad you like it, Jo! I am so amazed to see big list of these apps. I use only two or three apps to add text in photos but you have given me more options. Now I can use different types of apps for adding text. Thank you Louise. I’m glad to open smth new for me. I’ve never added text to photos and used only filters. Hope it can help my sister to gain success in her IG promotion and make content more interesting and breathtaking. Anyway, she doesn’t see the world through rose-colored glasses and use zengram.net for increasing her audience. It would be foolish to don’t seize an opportunity and try this service, especially when it brings interested followers, which are not fakes or ghosts. Do yo use smth like that? Yes, I have tried Instagress, but since it’s against IG’s terms of service, I don’t use it any more. You run the risk of having your account closed. Your kind of knowledge is great. I want to install twenty-second app in my Android phone. Can i install just now. Thanks, hopefully its will fun for me. Have you any updated advice now on these type of apps? I really am excited to play with some you suggested! I’m new to iPhone and this granny would love to impress her grands and grown kids! The only one I use now is Over. Had been using Canva from almost three years. Never saw a need to use something else. It is simple, easy to use and does what it says. Some cool designs do need you to pay money, but again, there’s no such thing as free lunch. Thanks for the post, will try a couple of more apps mentioned on the list. I’m glad you found it simple to use. Just beware of their commercial restrictions.